More real-world fun than an Audi R8 supercar? Is Audi's new S1 uberhatch the most desirable car in the German auto maker's almost infinite range? Don't forget, that's a range filled to bursting with super saloons, mega SUVs and even mid-engine, V10 rocket ships. You know what, it just might be. And we speak on the matter with pretty much total authority. How so? Every so often, one of the major manufacturers has a range review day. The bulk of a given brand's range is laid on for the press to drive. You're free to pick and choose whatever you fancy. Yup, we're horrendously, disgustingly spoiled. At Audi's latest instalment, the high-end performance tackle was everywhere you looked. An R8 V10 Plus 550hp-ish coupé to your left. Its plain old V10 Spider stablemate smoulders menacingly just next door. To your right is an RS7 super saloon. Sitting next to it on what looks like 26-inch alloys is the RS4 Avant hyper estate car. Chuck in an RS5 cabriolet for good measure. Oh, and don't forget the S3 mini sports saloon, its S3 cabrio sports hatch sibling and S3 sports hatch cousin behind you. And just when you thought you've got all the high-performance niches convered, don't forget the SQ5 sports SUV and Q3 RS mini hyper SUV, er, whatsit complete with a turbo five-pot engine pinched from the now-defunct TT RS. How could you, they're right there in front of you. When you consider the extent to which efficiency and emissions now dominate the car market, it's a bizarre spectacle. But Audi knows what it is about. These models are offered in the UK because people want to buy them. It's that simple. Anyway, it's in that very context that the Audi S1 finds itself literally surrounded by all manner of performance tackle. And yet, visually, it's absolutely not out classed. So compact, so purposeful, it looks a riot parked up let alone on the move. Moreover, in this age of so-called 'safety' cameras and social-pariah status for speeders, a quick blat in the 500hp-plus R8 models can leave you feeling like a sociopath. You need to carry so much speed to really enjoy those cars. By contrast, the S1's modest output of a mere 228bhp and the prospect of fun at speeds at least resembling the legal limit, not to mention a price tag that starts below £25,000, make for a terribly enticing real-world package. Time to jump on board. 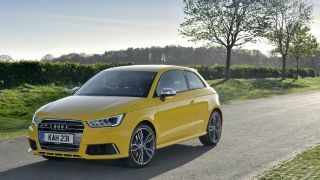 As with all the models in Audi's A1 range, the S1 belies its entry-level status inside. It's every bit as nice a place to be as the bigger A3 hatch. OK, you lose some passenger space in the rear, ditto luggage capacity. But the A1 and S1 are prettier and simply more fun to be around than the fusty A3 and its derivatives. Tech-wise, the tiny S1 is full featured. Audi's MMI system makes an appearance and delivers all the usual features including integrated nav, media playback and smartphone integration . Admittedly, the upcoming overhaul of MMI previewed in the new TT has instantly made this current MMI iteration look a little old hat. But it's still among the very best you can buy. Time to fire up the S1's engine. We're talking a turbo-charged 2.0-litre petrol engine mated to Audi's signature quattro four-wheel drive system. Oh and a manual gearbox. Yummy. The power output may be modest, but the 272lb/ft of torque is monster. And anyway, this is a tiny albeit surprisingly weighty (1,340kg) hatchback that's good for under six seconds to 60mph and 155mph all out. What more do you actually need? Nothing as it turns out. The S1 bolts down back roads with all the pace you could sensibly desire. The engine isn't exactly sonorous. But it's rorty enough and some old-school turbo lag gives the car a little added character. Ditto the manual gearbox. It makes for a modern sports hatch you really have to drive to make the most of. As for the chassis, if anything it's too good. The steering is ultra quick, giving the S1 a very darty front end. Combine that with epic grip and limitless quattro traction and you have a serious backroad weapon. If you want to pick holes, purists will note the steering is over assisted and devoid of real feel, ditto the brakes which ultimately have too much servo and travel. For most, however, the S1 will simply steer for Britain and stop on a 10 pence piece. It's ridiculous how capable it is given its status as a tiny hatchback sitting at the bottom of the Audi range. On the tech side, the S1 doesn't really do anything hugely dramatic we haven't seen before or add much to the A1 range's repertoire. In that sense, it doesn't rewrite the rulebook for car tech and it's not an obvious TechRadar car. But that's mainly because we're used to such a high level of kit from Audi. And anyway, the S1 isn't trying to out-tech, say, a BMW i3. It's actually quite an old school hot hatch at heart. So, if you want something, compact, manageable and classy with great road presence and plenty of performance in the real world, it's hard to see how the S1 can possibly be beaten.